My T1s are not three years old (I think). Any way they are in decent shape, except for the toes, which are almost fully trashed. Can I fix or prolong life with some kind of goop? Some toes on alpine boots are replaceable. I went through three sets over the course of my Koflachs’ lifespan. The pic is too zoomed in for me to see if those are replaceable. Are they just an extension of the sole or are they screwed on? No you have to resole. They are Vibram basically. Did I notice you using Axl's on your skis? I have Vices (same thing except no free pivot) and this is a common problem with them and Scarpa boots. I don't know that your boots are repairable, but if you don't use the pin holes, it's probably not a big deal. There is some thing you are supposed to do to lessen this, and I don't know what it is. It's something with the plate in that area. I'll see if I can look it up or in the mean time, I'd suggest you contact 22D. Definitely contact 22D if you have those bindings as it is an issue with the binding itself, not the boot. 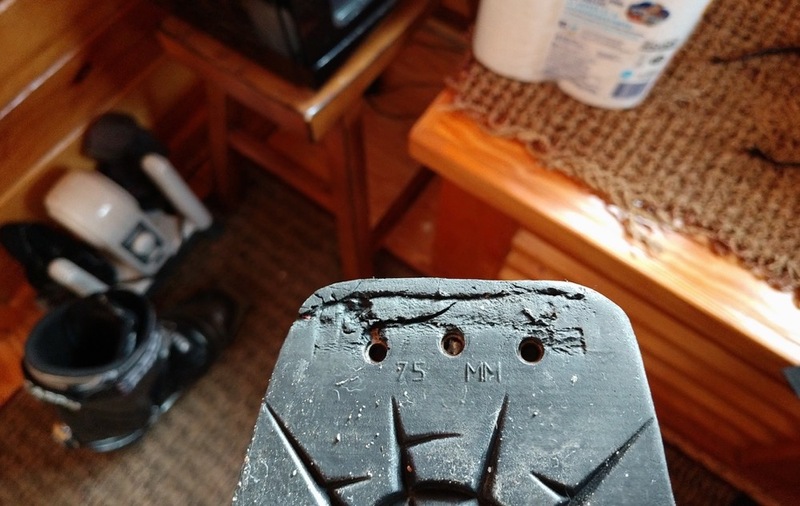 They may replace your bindings under warranty - but you may be screwed about the boots. Good news, those don't look nearly as bad as some of the others. Wow that is great beta. THANK YOU. Email sent to 22D. Time to go NTN Harvey. If you think your skiing went up a notch with the T1s wait until you ski NTN. CS, SBR any one... do you think I could get away with some Shoe Goo for a while? If you don't need the pinholes, then sure, try some Shoe Goo, FreeSole, AquaSeal, etc, just to clean it up and slow down the wear. If you are using these boots with pin bindings (no cables), then that is a different story and you should get some Smile Plates. A friend gave me a pair of beat up Scarpas (T3 maybe?) and the pin holes were pooched. I tried to use them with my Lite Spikes and it was a no-go, boots kept falling out. So I tried using G-Flex flexible epoxy to fill in the damaged area but that wouldn't bond with the boot material and the repair didn't hold. So I gave up on those boots, which were a bit big anyway. But I agree with Marc. If you're gonna buy new boots, you might as well switch to NTN. Keep those boots for tooling around on. You're almost all the way to NTN anyway (4 buckle boot, active binding). If it were me, though, I'd complain to Scarpa directly (the office in New Hampshire), and see if they would send me new boots. Doubt Scarpa will do anything. It's not the boots fault, it's the binding. Axl's have been eating up T1s (and T2s apparently) for years. I guess it doesn't happen on all of them but it's common enough that I knew what it was as soon as I saw the picture. I think I even read in one of the other posts Scarpas response to the guy was "take it to a cobbler" being out of the warranty period.